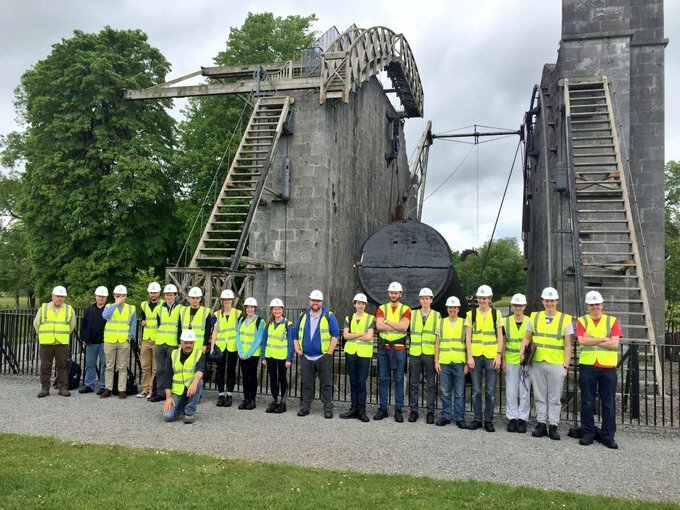 UCD Physics with Astronomy & Space Science student Rachel Dunwoody writes the first in a series of posts about her internship experience helping to build the I-LOFAR radio telescope in Birr. 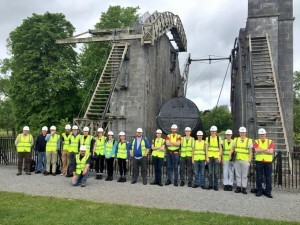 This is the first of a series of 4 posts which will cover the 10 week internship in Birr building the telescope. 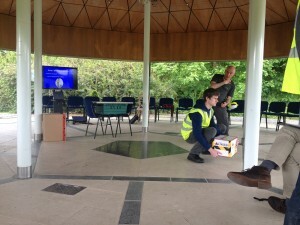 Myself and Kevin Flanagan are the two third year UCD Physics with Astronomy and Space Science students that are helping to build the I-LOFAR radio telescope in Birr over the summer. 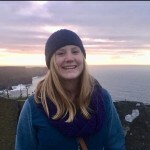 This is the first of a series of blogs and it will discuss the initial two weeks of our internship. 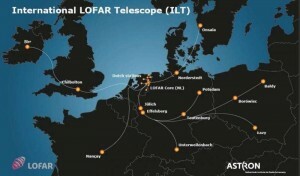 LOFAR, standing for Low Frequency Array, is an international network of radio telescopes. The core is in the Netherlands and there are 11 international stations across Europe. The Irish LOFAR station is the 12th international station built and gives Irish researchers and students the opportunity to be involved in state of the art astrophysics. This includes projects on solar physics, space weather, pulsars, big bang cosmology and cosmic rays to name a few. An optical telescope looks at objects in space in the visible part of the electromagnetic spectrum (400nm – 700nm) where as a radio telescope looks at at longer wavelengths, from millimetres to hundreds of meters. An optical telescope will have a system of lens’ and mirrors to magnify the object that can be viewed using an eyepiece or camera. A radio telescope receives signals via one or many antennae which need to be processed to produce an image or spectrum of the observed field of view. 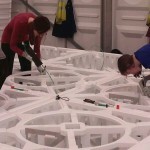 For Ireland, a radio telescope is advantageous as the radio waves detected are not obstructed by clouds and observations can be made easily during the day as well as at night. During the day the Sun means that the optical waves from distant objects are often not detected as the Sun is much brighter. I’ll admit I was nervous when I was first offered the internship as it had been advertised as being predominantly manual labour rather than a research based project. I have no claim to strength and no construction skills but it was such a unique opportunity, I had to take it. In reality, the major factor that influenced me to accept the position was Dame Jocelyn Bell Burnell, the physicist from Northern Ireland that discovered pulsars. During my attendance of the Conference for Undergraduate Women in Physics in Oxford, I asked Dame Burnell about her experience in building a radio telescope when she was a student. She convinced me to accept the internship by explaining how beneficial it is to learn how to build the instruments you use as a physicist as it gives you a better understanding of how they work. She also warned me to bring rain gear as building a radio telescope in Ireland was never going to be a dry and sunny experience. Thankfully, I listened to her advice! Now I can tell you taking it was an excellent idea (as were the waterproof trousers!). On the first day, we had to complete a Safe Pass course with SOLAS. Safe Pass is a one day course for construction workers to highlight safety awareness on site. After this and the manual handling course I am more aware of the machinery on the construction site and ensure that I am always wearing my hi-vis jacket, hard hat and steel toed boots. At the time, the four hours learning how to lift objects seemed a little excessive but after all the lifting of palettes, plywood sheets and boxes of various sizes onsite, it turned out to be very useful. Putting the training into practice! Initially, we had to get all the cables for each of the 96 HBAs (High Band Antennas) and 96 LBAs (Low Band Antennas) laid out from the field to the container. The information from these antennas are sent to the Netherlands for processing and storage. Each antenna required two cables which were either 85m, 115m or 135m long. These cables had to be laid out carefully in deep trenches that were dug out by excavators. This was so no kinks occurred which would inhibit signals being passed along them once the telescope is in operation. 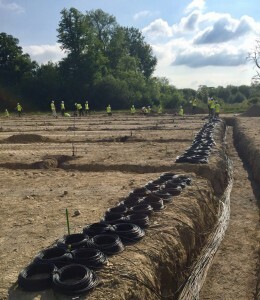 In week one we laid the HBA cables. This was during a heatwave (for Ireland anyway) so layers of factor 50+ sun cream were needed which made the dust stick to us. The cabling was completed by Friday before the rain of the weekend and the cables covered in sand to protect from any falling rocks and debris. All in all everyone was proud of the productivity of the first week. In the second week, the LBA cabling began, but the lashing rain made this cabling a much more miserable affair. The trenches collapsed easily from us brushing against the walls. Standing too near the edge could cause a mini cave in of the trench wall which was treacherous for the exposed cables. However, with everyone working together filling in sand as we went along and monitoring the walls of the trenches, we were finished by the end of week two. Another unexpected issue with the cabling was the influence of the local wildlife. One morning, six gnawed cables were discovered and the surrounding hoof prints indicated that the red deer decided the cables looked like a nice snack. Many attempts were made to deter the deer with noisy cannons and by placing plastic poles around the exposed cables. Now there is a tall fence so hopefully there won’t be any more chewed equipment! As part of the internship we are provided with accommodation in Highpark House. The walk to the construction site only takes about 25 minutes and with a Tesco just 5 minutes away last minute cereal and chocolate buying is very easy. This is my first experience living away from home, one house with 17 students is certainly a busy place. Finding room in the one fridge is always a challenge. 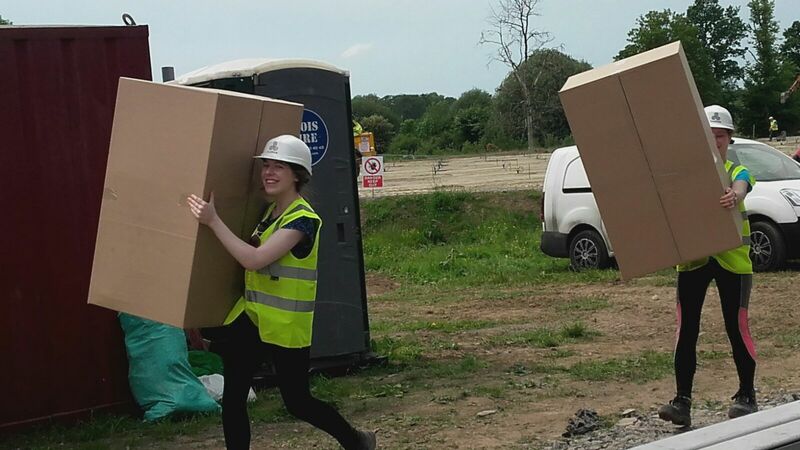 In the evenings, we are all pretty tired from the hectic day on site and more often than not end up in the sitting room playing a card or board game and relaxing. On one of the clear nights, Alberto from DCU set up his telescope and we all observed Jupiter with its gas clouds and four moons. Next week, we will describe how we started building the HBAs and Kevin will keep you up to date on our progress!